Have you ever noticed that God loves to whisper? 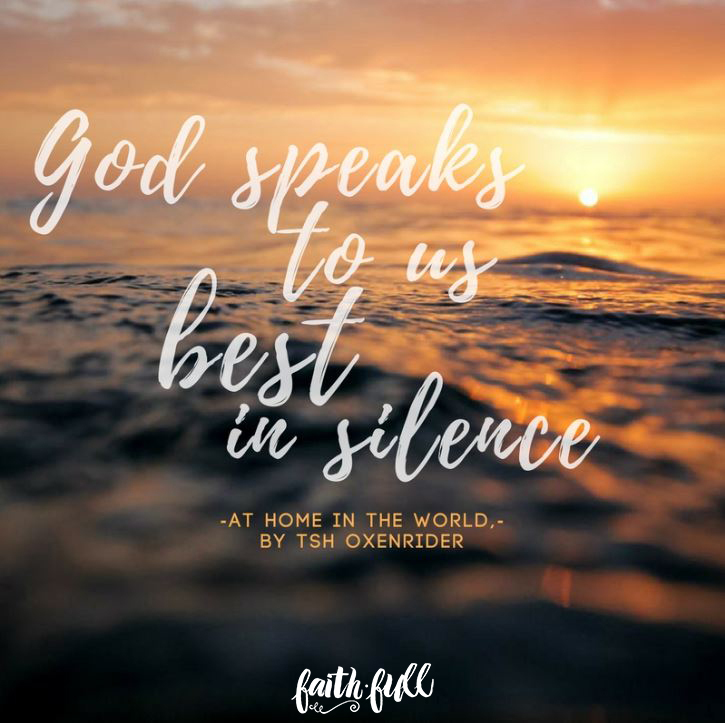 I have… Often, God’s voice is barely heard. In times when my mind is the loudest, God’s voice is softest and I used to wonder why. You see, I’ve learnt that God is fond of whispering into our soul because He wants us still and quiet. He wants us to hear only His voice. So if we are really seeking to hear His whispers and will, then we have to do that in the quiet. There was a time when I used to struggle with that. I used to have a very loud mind. I used to entertain too many voices that I could never hear God’s. When things got tough I could never rest in Him because I lacked the strength to fully trust in Him. When we lack trust in God, we can never be still in our soul. Then was a time when I wrestled with God. I didn’t understand him or His ways and more importantly, I didn’t understand why He wasn’t explaining what He was doing. I thought we had a partnership so, I figured it’s not too much to ask Him to let me in on His plans. I mean, it was still my life wasn’t it? It was a time when I was struggling with so many decisions, directions and situations. I needed breakthroughs, changes and His promises fulfilled. And so it began. I decided it was time to get real personal with God. I dug my heels in deep and confronted Him. Every day, I would ask Him – Why? When? How? Where? What? And every day, I would remind him that I was obedient. I was faithful. I was seeking. I had surrendered and gave up all control. I was fully dependent on Him. Then, I would ask all my questions. All. Over. Again… The next day, rewind and repeat. Then, I would sit and stew..waiting for a voice from Heaven to boom out answers to me. Days turned into weeks and God was silent. I was mad. Eventually, I got real and told God, “it’s ok. I didn’t need a thundering voice from heaven, a whisper would suffice”. I stopped with the questions, then I stopped talking to Him altogether. I became still, sullen and silent – simply out of exhaustion…and slowly something began to unravel in my mind. Those endless questions I had? That very need to know? That was still control. In my silence, the Holy Spirit gently revealed to me that I had not in fact completely surrendered. “… in quietness and trust is your strength…” In my quietness, I learnt to trust. Not easy at all! I admit that for me to say that wholeheartedly and then faithfully place all my circumstances on His alter was like pulling teeth – minus the Novocain! After all, I’m just a mere mortal still learning to walk well with my Saviour BUT in yielding, God makes it easier. In fact, when I let Him, God even shows me how to unclench my controlling fists and let go. But I had to let it all go; when standing required too much strength, I knelt. It was in that very posture of yielding that I found God – next to me, right where I was – down on my knees in a state of sadness, confusion and uncertainty. In that one moment, I felt His peace weave through the maze of my mind and suddenly the clutter ceded. Then, His strength lifted me back up and I felt a familiar bounce in my step. And I remembered…“… in quietness and trust is your strength…” In my quietness, I gained my strength. I realised then it is in this very knowing – that even when God is silent, or when I feel lost, alone or think I’m drowning, and even when I don’t see or feel His hand in my circumstance, I know in my heart of hearts that God is in the water with me. Always, in my quietness and trust in Him, I am hidden in His rest and that gives me strength. Are you carried by His strength?